Congratulations to the Eye Hospital team for their fantastic nomination in this year’s HSJ partnership Awards. They’ve been shortlisted in the Best Pharmaceutical Partnership category for innovating the delivery and capacity expansion of macular services. 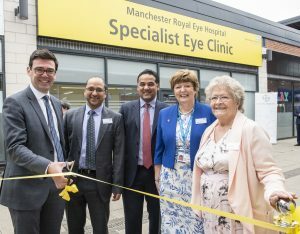 In an initiative in partnership with Bayer plc in 2018, two community eye clinics were opened in North and South Manchester as part of a ground-breaking approach to deliver high quality hospital expertise for patients closer to where they live.